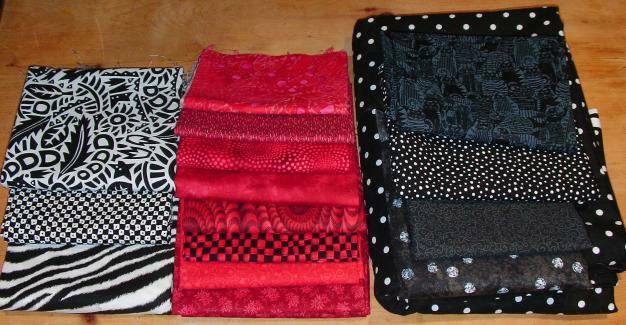 I’ve been looking at these red and black fabrics all day long, moving them around the house with me as I go from room to room doing different chores. They just seemed “wrong” to me. Values too similar, not enough contrast. Maybe that’s why this red and black project didn’t appeal to me in the first place. My subconscious was telling me that my fabrics were too boring. So I went digging in the stash some more and came up with three black and white prints that I think will give some personality to this quilt, something to really make it sing!